Today we start a 4 week series on what makes great healthcare IT consulting. Today we start by looking at Allscripts Consulting. A great Allscripts consultant can understand the complexities across Allscripts open platform of clinical and business performance solutions for ambulatory, acute and post-acute care settings whether it’s the Sunrise Clinical Manager suite of products or the Enterprise products. These healthcare consultants provide additional expertise with the ability to work on one component (e.g. SEC), or can work on end to end projects from Strategy, Roadmap, and Design through Activation and Optimization. Given the complexity of Allscripts' electronic health record software and the unique skills required to install, configure and test, it's not a job that most in-house healthcare IT departments can handle alone. As such, finding the right consultant is crucial. Great Allscripts consultants are focused on client success and realize Allscripts is much more than another software tool. 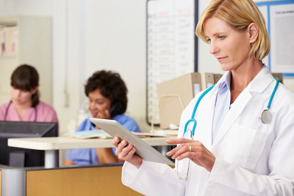 Electronic health records revolutionize how healthcare is delivered, described and managed. With this in mind, an Allscripts consultant doesn't just work within your IT department. He/she also works closely with your clinicians, since they're the ones that will be working with the software day-in and day-out. The best consultants understand this and involve your clinicians as a part of process. Many of the best healthcare IT consultants also have clinical backgrounds and understand the workflow of your healthcare providers, or if not look for a healthcare consulting firm that has a large number of clinicians on staff so that they can understand what your team needs and communicate to your team using their language and their particular styles of interaction. Choosing the right healthcare IT consultant is imperative. It almost goes without saying that an Allscripts consultant should have experience and certifications with the latest versions of Allscripts software from Sunrise Clinical Manager products (5.5 to 6.1) to Enterprise through v11 with multiple installations in their area of expertise. Additionally, great consultants will have certifications in different modules, therefore affording the ability to cross implement. Furthermore, they should also have an understanding of older iterations so that they can help you integrate legacy systems or manage an upgrade while allowing your staff to move forward with the latest version being implemented. Being able to talk about "years of experience" isn't enough, though. The consultant should be able to provide a list of many projects that are similar to those of the Hospital seeking the consultant. Any consultant's value proposition comes from their previous experience of encountering challenges or issues, therefore allowing them to leverage that knowledge to work on subsequent projects more quickly and with a higher level of success. Knowing the Allscripts products isn’t enough with the ever changing government policies for healthcare. A great healthcare consultant must also know what is needed to be implemented in the Allscripts modules for the health system to meet all these changes. Some must understand Meaningful Use and what criteria needs to be met by the health system, some need to know the HEDIS and NCQA standards along with many other policies. These healthcare IT consultants work beyond the confines of the IT department to offer support and must keep up with the latest changes to improve the quality of care within the health system. All in all, a great Allscripts consultant has a broad assortment of expertise to offer health systems and could be the difference for a successful implementation. What Makes a Great Epic Consultant? What Makes a Great Cerner Consultant?